There's a mob of web survey software in the marketplace. But as Tim Macer reports, one offers more than meets the eye. Cleverform is a web interviewing solution with a twist. On the surface, it looks like a better-than-average offering in the crowded web survey software market (there were 65 packages for MR users at our latest count). Underneath, it reveals itself to be a heavyweight in disguise, overcoming problems that many of the standard packages fail to address, such as combining data across surveys, or offering better integration between email invitations and the web survey pages. 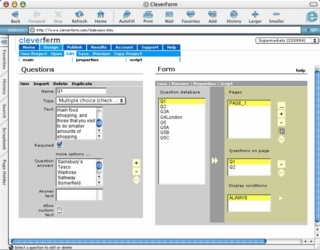 Cleverform is offered as a browser-based ASP solution by Code Development (a UK/Serbian company with offices in London), either hosted on its own servers, or installed on your own network. The current version is implemented in UNIX using MySQL, a widely used open-source database, popular in the UNIX world as it is virtually free of charge. It is currently being ported to Oracle and Microsoft SQL Server, however, to satisfy corporate users. Cleverform takes the concept of templates a stage further than most by letting you specify different templates for different respondents by demographics - or any known data. 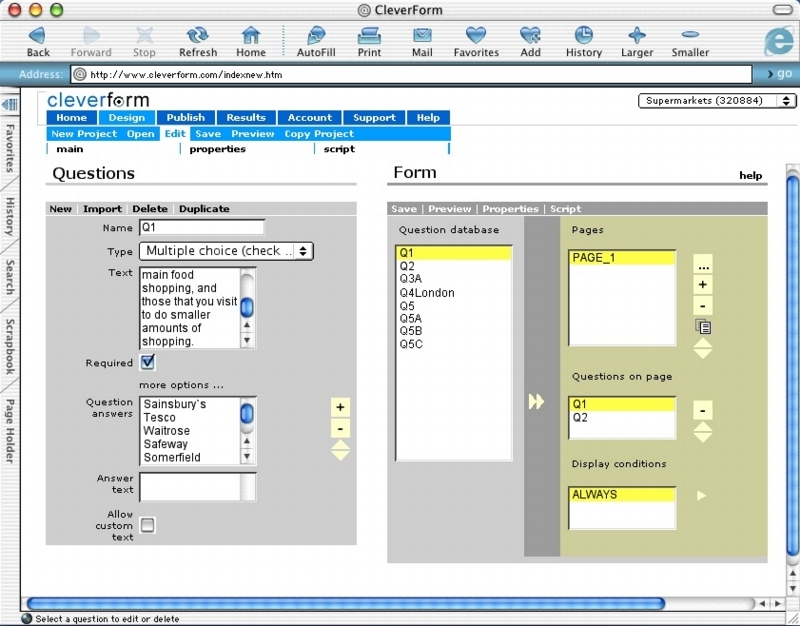 Complex surveys can be tackled by using the systems own scripting language, CF Script. The editor uses a simple concept of pages and questions to allow you to present more than one data-capture field on the same screen. By default, it will place each new question on a new screen, but a page window lets you move questions around the pages very easily, or even place everything on one page. This has another benefit when you look at Cleverforms integrated email invitation module. Another major difference between Cleverform and most other survey packages is that the database is respondent-centric, with all the answers from previous surveys being pooled and available in subsequent surveys or across surveys. In effect, a survey is just one view of the database, in which the questions are presented in the order in which they were asked. At present, the solution lacks the tools to exploit the database fully: updating is not quite there yet and filtering or selecting is very clumsy. However, this system has great potential to span panel management, survey management and even continuous research management as it grows. It is a very open system, and provides triple-s output from its data. Cleverform actually stored the question definitions on the database as triple-s definitions, though at present this is the old version, not the XML version. What this means is you can design the questions in any software that writes out triple-s definitions, and import the question definitions into Cleverform. Sage Research, a Massachusetts-based research agency specialising in the technology sector, has started using Cleverform as a pre-research tool. Occasionally we have a need to just get a feel for whether or not people are using a particular product, explains Vincent Stolo, Field Co-ordinator at Sage. Perhaps Cleverforms biggest problem will be getting stuck in the cheap-and-cheerful DIY camp, for underneath is a real pros resource just waiting for recognition. Published in Research, the magazine of the Market Research Society, September 2002, Issue 436.